Cleaning your watch isn’t as complex as it sounds. If you have a real issue with your watch – it’s running fast or slow or seems to contain water – you need to take it into a watchmaker. 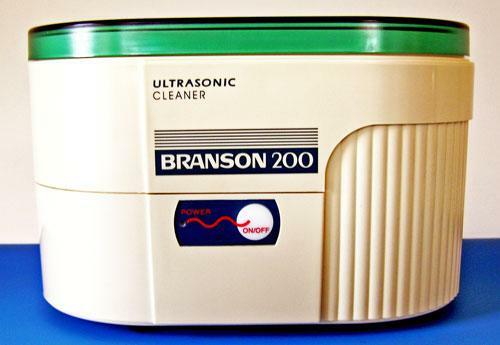 However if you just want to clean up your watch get yourself an ultrasonic cleaner. I bought a $70 Chinese model on eBay but you could also get something like this Braunsonic. The cleaner vibrates a water bath which in turn creates tiny, energetic bubbles. These bubbles get into all of the nooks and crannies of your watch bracelet to pull out dirt. The process takes about 15 minutes for a fairly good cleaning and you may need to clean dirtier watches a few times. My Omega Seamaster had a few clumps of grossness in the case and a run through the ultrasonic bath for about 15 minutes cleaned them all out. You can place any watch that has a depth rating of 30 meters. Do not bathe non-waterproof watches as the action of the bubbles could introduce water. I sometimes drop a few drops of hand soap into the water for stubborn dirt but you can also try special soap concentrates. For a small investment you can clean almost anything with this thing. Sunglasses, rings, necklaces, and bracelets all came out cleaner and brighter. Give your nicer watches a few trips through the bath and the machine will pay for itself in the long run. This is cool. I have a SE mbw-150 bluetooth watch so cross my fingers and hope I don’t mess it up. Most models have a little piece of plastic that will hold the watch itself out of the water. This is more for cleaning the bracelet. John is right; my Chinese cleaner came with a plastic piece to put the watch on so the watch body isn’t in the water. Even water resistant watches can suffer if totally immersed. Don’t ever let the watch rest directly on the metal container, the ultrasonic vibration will scratch the watch and container. set the watch on a small swatch of cloth on the bottom of the container. Never let the watch face touch the bottom of the container, it will be scratched. I had a cheap water resistant watch break when immersed, the second hand vibrated off. Hi, I’ll have to give that a try. I’ve been using Veraet Watch Spray as a easy way to clean my watch after I’ve been running. But for more serious cleaning, I’d be willing to give what you recommended a try! I would be a little concerned about the possibility of those ultrasonic vibrations loosening something in a watch’s mechanism. Keeping the watch out of the bath seems like a good idea to me. This is nice info right here, i been use a toothbrush and paste to clean up my watch, but now i’m thinking in investing in a ultrasonic cleaner.